Have you ever watched a movie and it was so touching that your eyes teared up? You wonder how things that have nothing to do with you are affecting you so deeply. 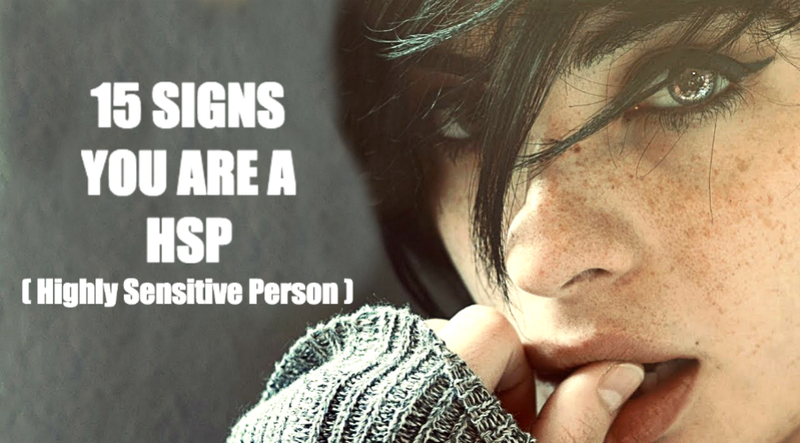 If this is true you are probably a highly sensitive person or what is known in psychology as HSP. Being highly sensitive means that you absorb and perceive information on a much deeper level than a regular human. You feel deep connections and strong feelings, but you also get really hurt by people who perceive things differently. You stress over little things and you can’t handle drama, especially when there is conflict in your relationships, you feel drained. This is normal for a highly sensitive person. It’s not a flaw it’s just a negative effect of experiencing the world so deeply. If you still don’t know whether or not you are a HSP here is a list of signs that every HSP experiences. 1. You have difficulty letting go of obsessive negative thoughts and emotions. 2. You feel physical symptoms like headaches, heightened stress and anxiety when something unpleasant is about to happen during the day. 3. You live with constant anxiety and you probably have coping mechanisms to deal with it. 4. You feel anger or resentment about situations in society, sometimes even in movies, which seem unjust, aggravating, or simply annoying, even though they might have nothing to do with you. 5. You tend to overthink things. 6. You often take things personally. 7. You worry about what others think. 8. You have a hard time accepting critical feedback, even when it’s given reasonably and constructively. 9. You hide negative feelings, believing they are too strong, turbulent, embarrassing or vulnerable to share, so you suppress them within you. 10. You feel awkward in social events or romantically intimate scenarios, unable to be yourself, highly worried about your partner’s approval and afraid of being judged and rejected. 11. You are extremely irritated by chewing noises and other seemingly harmless actions. 12. You feel uncomfortable when exposed to bright lights, loud sounds, or certain strong scents. 13. You feel highly upset when watching or reading negative news in the media. Even negative music might stress you extremely. 14. You feel unhappy, almost depressed and sometimes angered when following other people’s posts on social media. 15. Movies songs and stories deeply touch you and you often cry when watching or listening something sad, you often thought to yourself that music can have a complete control over your mood, you feel almost powerless when it comes to choosing your mood. 1. Time and place to unwind after a busy day. Because you are affected by the daily turmoil much more than a normal human you need a special place and time at the end of your day to unwind. You need to set a stress free room for yourself where you can relax, dim the lights, listen to soothing music or maybe drink some tea in silence. 2. A simpler pace of life. A busy life does not mean a successful life. Some people like being busy, it gives them a sense of productivity. But for you, being busy means high levels of stress and anxiety. It might even feel like you are in prison. That’s why you should construct a simpler life. Find the things that give most of your results and focus on them. Make sure to implement days for relaxation. Start your days slowly. Create a daily schedule that’s effective but not stressful to you. 3. Freedom to express your emotions. Being highly sensitive means you will feel much deeply about things that a regular human might not even bat an eye. That’s why you need to have a healthy relationship with your emotional self. You need to express your emotions much more often because you accumulate them within yourself. Give yourself freedom to express your emotions. Find a friend or a family member you can freely speak with daily, someone who loves you, and share how you feel. If you feel like crying cry, without feeling shame. Embrace your emotions, feel them, express them. This is a must for a highly sensitive person. Play is something that needs to be a part of your daily life as much as food. For a HSP play is food for the spirit. Doing an activity, free of being right and wrong, and without much risk involved, is a little vacation for a HSP. Social games, video games, whatever you prefer, have one hour per day filled with play. 5. Healthy meals, good sleep, exercise and meditation. A healthy lifestyle is necessary to maintain a healthy being. A healthy being has energy and positivity to tackle the world. Eating organic food, more green veggies, fruits and less meat will give you additional energy and positivity to tackle your day. Exercise is good for your health and balancing of your hormones to prevent additional emotional turmoil. A good sleep is necessary, at least 8 hours per day. And meditation is a practice that will reward you with mental clarity. All fo this will make it much easier for you to feel the world on as deep level as you feel it. But not just that, it also improves your overall mood. 6. Time to adjust to change. One thing is certain, change is inevitable. But we all react to change differently and we all need a different pace to deal with it. Controlling things is your thing. When things are as they are there is not much chaos, meaning you don’t need to deal with unexpected emotions. When there is change you need much more time than a regular human to adjust because you perceive this change deeply. You see patterns other people do not see, you deal with emotions much more intensely and you perceive information much more deeply. So don’t go against yourself. Give yourself as much time as you need to adjust to change unapologetically. Being around large crowds of people is draining to you, but being around people you have meaningful relationships with is recharging. When you feel and care about someone you do this on really deep level. And you think that all people feel as deeply as you do. Sometimes it’s intense for people to be around you because they feel the depth of your love for them, and they don’t feel the same. There is nothing more upsetting for a HSP than a relationship they thought was meaningful that turns not to be. That’s why you need to find the few right people who are willing to connect with you deeply, and maintain those meaningful relationships. 8. Lifestyle free of caffeine and alcohol. Caffeine and alcohol are anxiety boosters. Because you constantly feel at least a little sensation of anxiety, consuming these is not wise. Implement more fresh juices, smoothies and drink more water. You can get teas that are proven to reduce anxiety like green tea or peppermint tea. Experiencing the world on a deeper level is not bad. In fact, it gives you a great material for art. Most of the greatest artists in the world were highly sensitive people who used their deep insight and intense emotions to create beautiful work. Write, paint, sing, create music, find your creative outlet and create something beautiful. 10. A strong sense of purpose. Some people seem to drift through life without direction or purpose. For HSPs, this is unthinkable. Rather, they think deeply about the big things in life. Who are they, why are they here, and what were they put on this planet to do? Whether it’s writing a novel, traveling the world, or leading the way for a cause they believe in, sensitive people crave a cause that’s bigger than them. This sense of serving something bigger reliefs them from anxiety and gives a meaning to their deep emotions. Being a highly sensitive person is not a bad thing. It means you see the world with eyes who see something others don’t. When there is beauty you see it and feel it so intensely that you might get obsessed with it. When you connect with people, nature, animals, you do it on a level not many can understand. When you feel love, oh boy, you feel it on a level that most people don’t come even close to. You have a gift of experiencing everything deeply. Sometimes it’s overwhelming but most times it’s rewarding beyond description. It’s like everybody watches a video and you watch it on ultra HD. So use your gift to create. Use it to share with others the beauty not many can see.